"Traditionally, a unique gift would be something like a personalized hip flask, fountain pen or coffee mug, but a unique gift can be so much more than that – an experience gift will be a unique adventure to the lucky gift recipient. Although others may have done the experience previously, each experience is unique to the individual. 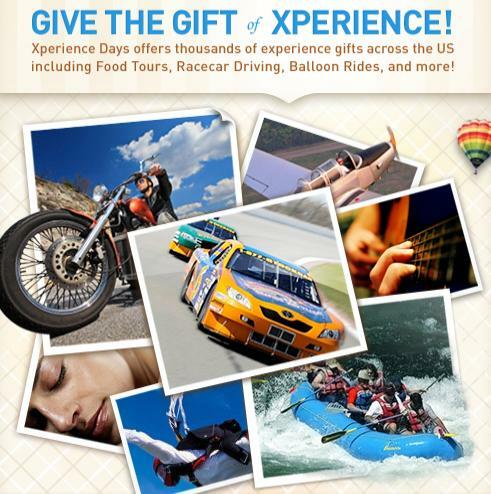 Xperience Days is the country's leading Unique Gifts, Adventure Gifts and Experience Gifts company, offering thousands of unique gift experiences nationwide. Experience Gifts are perfect gift ideas for Christmas Gifts, Wedding Gifts, Birthday Gifts and more." Food truck tour in D.C.
Oh my gosh, I would LOVE to venture the "Americas Cup Sailing In San Diego For Two." How fun does that sound? Sailing for 2, helicopter for 2, or paragliding. I would love to get my husband the "Learn To Fly a Cessna in Charlotte" experience! Tandem Sky Dive in Lancaster!! i would love the hot air balloon ride! NASCAR Driving experience of coarse! It is difficult to select gift according to the personality of each person. Every time I go to buy new gift , I have to think lot of factors like choice of the person for whom I am buying, whether it will give any benefit to that person or he may like or not. for buying gifts because I get some coupons and deals with great gift ideas.